These are the second set of reviews from this year’s The Key: Young Critics Mentorship Program. Members of this cohort are: Sierra Carlson, Yasmin Mikhaiel, Aaron Lockman, Elon Sloan, and Lonnae Hickman. All reviews are workshopped and edited by co-facilitators Oliver Sava and Regina Victor. Check out their reviews of The Curious Incident of the Dog in the Night-Time at Firebrand Theatre in collaboration with Timeline Theatre below! Steppenwolf for Young Adults begins its 2018/2019 season by asking: When you feel lost, how do you find your way? The Curious Incident of the Dog in the Night-Time asks the same question of Christopher, a neuroatypical teen whose quest to uncover the mystery of a murdered neighborhood dog leads him on a journey to deeper truths about his own family. Simon Stephen’s adaptation of a young adult novel by Mark Haddon receives its first Chicago production on Steppenwolf’s stage, but it is unclear if the theatre is prepared to present what was previously such a spectacular Broadway hit. The set is simple. Four metallic pillars square off a performance space with only silver chairs and acting blocks left to construct each scene. Everything else is empty space. The actors transform and fill this space with Terry Bell leading the charge as Christopher. Bell is tasked with the primary role of storyteller, and he does a wonderful job creating and sharing the way that this unique teenager experiences the world. He would be unable to pursue his great adventure, however, were it not for the support of a fantastic ensemble. Actors sitting on the sidelines jump in when needed to serve as police officers, friendly neighbors, or London commuters. When not performing specific roles, these actors work as a unit to build the ever-changing world around Christopher. Seamless movement developed by Dan Plehal expertly fills the space left unoccupied by a stationary set. The empty space behind and above the actors is filled by images of the galaxy, maps of London, and written lists projected onto the large screen to the back of the stage. For a design element which takes up so much of the visual space—most of the visual space—the design is at times missing a clean finish. The unfortunate sound of fans that must accompany any use of projectors bleeds into Pornchanok Kanchanabanca’s sound design so that any time not occupied with purposeful sound is filled with a drone or hum from the fans above. The production drags in energy, making my attention wander to the equipment above me, making an already slow play crawl. What I really need from this production, and what was promised by the question asked of the season, is DISCOVERY. Jonathan Berry’s direction does a wonderful job of establishing environment and relationships, but falls short of making any discoveries. A mystery about getting lost within twists and turns feels more like a left-right march from beginning to end. When major plot developments are revealed, the audience barely responds. When a dog is brought on stage, people practically leap out of their seats. With all that said, this is a heartfelt story about a family that families will most certainly enjoy. This production does have many beautifully crafted moments, and when the projections hit the mark they wow. If you stay after the final moments, you are in for a treat. Everyone can find something to love in this production. Finally, I must end with this: Steppenwolf’s decision to not cast a neuroatypical actor. This decision is acknowledged in the pages of its program, but as a second thought and with a defensive tone. Buried on page 19 is a blurb about Christopher that begins “Haddon has often stressed that he did not set out to write a story about teenagers with Autism Spectrum Disorder (as Christopher is often diagnosed by fans)…” The theatre is clearly aware of the debate surrounding the casting decisions and is using audience materials that only some might ever read to address this. Is that enough? Is Steppenwolf trying to have its cake and eat it too? The ethical dilemma surrounding these decisions is something that I’m still considering days after the production, and I’m not sure where I fall, but I do know that it’s a conversation worth having. The Curious Incident of the Dog in the Night-Time tells the story of Christopher, an autistic 15 year old boy who struggles to navigate turbulence in his family life. Written by Simon Stephens and directed by Jonathan Berry, this play is the latest of Steppenwolf for Young Adults’ offerings for teenagers and high schools. As a former member of Steppenwolf’s Young Adult Council, I love going back to see what SA is producing. Because SYA responds to a younger, more racially diverse audience that is potentially new to or even uninterested in theatre, they create work that looks and feels completely different than the mainstage season. Generally, if I make it in to one of their short runs I’m expecting something fresh, visually interesting, and often politically engaged. We follow Christopher, played by Terry Bell, as he tells his experience of doing detective work to solve the murder of his neighbor’s dog in the form of a school play. This “school play” decision is emphasized by a pretty traditional “chairs and boxes” quasi-Brechtian set with a few moving pillars thrown in. The decision to pare back the set feels like Chicago’s more intimate and artsy answer to Broadway’s tech-heavy spectacular approach, which made sense to me. But, contrasting this barebones set is a pretty continuous stream of projections and evocative lighting cues which are meant to help the audience track Christopher’s thoughts and manner of processing the world around him. These projections were numerous and didn’t always have a cohesive look, sometimes they were slightly incongruous with what was happening on stage. I found them really overwhelming and distracting from the actors, especially when they were accompanied by movement work. The second most noticeable part of this production’s visual language to me was the movement work. This Curious Incident features lots of moments when the ever-present ensemble sweeps around the stage, sometimes carrying symbolic props or Christopher himself. These moments are beautiful, but I sometimes didn’t understand why they were happening and what parts of the story they were trying to emphasize. Terry Bell plays Christopher and Cedric Mays plays his father, Ed. Their portrayal of Ed and Christopher’s relationship is beautiful and one of my favorite parts of this production. I also found it heartening to see this story reframed a little through the choice to cast a Black Christopher. Autism his historically been under-diagnosed along lines of race and gender, and this real world disparity has been coupled with media representation which forefronts white men. The choice to make Christopher and his father Black felt like a small but conscious step away from that and toward better representation on SYA’s part. With Curious Incident comes an ongoing debate about representation and media inclusion and neuroatypical individuals. There have been many protests against neurotypical actors playing Christopher, enough to influence other production of this show. I wasn’t able to find anything in the program notes or promotional materials which addressed this ongoing debate. There are plenty of materials which discuss why SYA is so excited to tell a story which centers a neuroatypical character, but little is mentioned about how their production process and casting or production team choices were different. The general conversation around media inclusion goes so much deeper than representation and questions of who can and cannot become a creative professional and where they can be employed are a huge part of that discussion. The Curious Incident of the Dog in the Night-Time left me wanting more. There’s lots of strong acting but the visual aspects feel like disparate parts rather than a whole. SYA has produced some of my favorite plays in Chicago and I was really looking forward to seeing them make this show their own. Somehow, it just didn’t seem to come together. In the spirit of disclosure: three days before I saw The Curious Incident of the Dog in the Night-Time at Steppenwolf for Young Adults, I saw the production in Louisville, Kentucky, at Actors’ Theatre of Louisville. I was incredibly moved by the Louisville production. Then I came back and saw this. The best way I can think to describe seeing these two shows back to back is going on a roller coaster, and then taking a long, pleasant drive in a Prius. Both experiences were excellently engineered, and achieved what they respectively set out to achieve. But the sad fact remains that one was simply more exciting than the other, and it was difficult not to compare the two. Steppenwolf is always an odd theatre to walk into, because they have a lot of money, but seem to try to hide it. Their downstairs proscenium theater is decorated more like a blackbox, and Brandon Wardell’s set evokes a college theater classroom in its monochrome simplicity, complete with black moveable boxes as furniture. Curious Incident is famous for its tech; how projections, lights, and ensemble movement illuminate for us the inside of Christopher’s head, helping us see the world how he sees it. And while all that is present here, it seems to take a backseat: Jonathan Berry’s direction aims to put the actors front and center, to take a tech-heavy, Broadway-sparkly show and Chicago-ize it by stripping away the artifice. And that works. . . to some extent. At times, the ensemble creates some really compelling moments, where their movements perfectly mirror Christopher’s emotional state and coalesce into stunning, transcendent stage pictures. However, these moments stand out because the ensemble work is largely weak; they seem to have trouble synchronizing, and the choreography often feels musical theatre-y and too big for the space. This, plus the bizarre usage of boxes as set pieces (evoking the high school drama club sketch from SNL) contributes an unfortunate air of amateurishness. Thankfully, Christopher is the backbone that holds the show together, and Terry Bell does beautiful work, taking the character’s tics and quirks and forming them into a truly likable young man. His Christopher is stoic and reserved, but warm and eager as well, and as a result his triumphs are joyful to watch. Cedric Mays and Rebecca Spence as Christopher’s father and mother respectively also deserve mention: Mays is sad and thoughtful and ponderous as Ed and gives empathy to a character that is easy to hate – and Spence is truly heartbreaking as Judy, struggling to love the son she has so much trouble understanding. Ultimately, Curious Incident is a show about empathy, about putting you inside the perspective of one neurodiverse boy whose experience might be alien to you, and letting you see the world through his eyes, feel emotions through his heart. And this production succeeds tremendously at that, albeit with less punch than I might have liked. Bias Alert: My friend Christopher Boone is in The Curious Incident of the Dog in the Night-Time at Actors Theatre. In its new Chicago staging, The Curious Incident of the Dog in the Night-Time just doesn’t fit. Set in England, many of the moments hit Chicagoans differently. There are moments that may shock, and many that may anger. A Steppenwolf for Young Adults production, Curious Incident is usually praised for showcasing the value of difference in the face of adversity—namely through Christopher (Terry Bell), a neuroatypical fifteen-year-old who stumbles upon the neighborhood dog, dead in the night-time. He’s a math genius who has a harder time reading social cues and absolutely does not lie. He decides to solve the mystery of the dog’s murder and embarks on a journey that everyone views as impossible. The show is an opportunity to showcase bravery and the pains of growing up amid family turmoil and uncertainty. 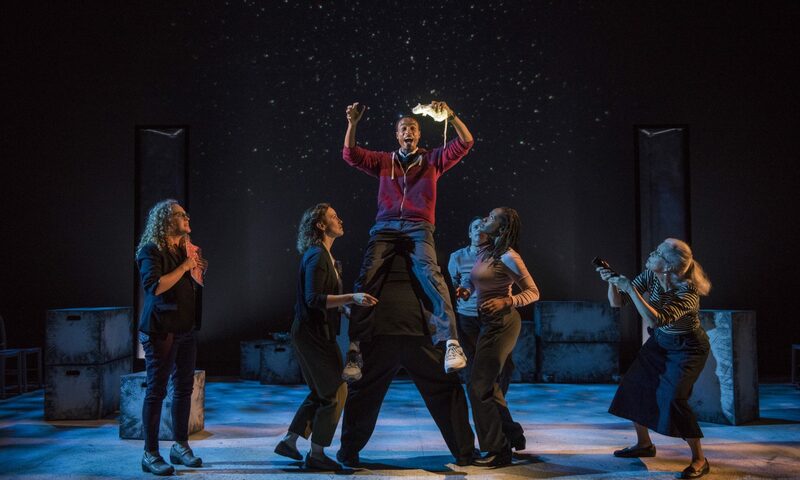 Adapted by Simon Stephens from Mark Haddon’s 2003 book of the same name, this two-and-a-half hour production feels less like a nostalgic read and more like a musical where the opening number never comes. The set feels Chicago in its dark bareness, leaving the stage to be activated by the tight ensemble and stellar projections from Joseph A. Burke. It is difficult to discern where and when we are with the play-within-a-play motif, and the show is noticeably lacking a dramaturg. Though oversized, stackable cubes and handfuls of chairs aim to place us in a high school drama club, this complicates Christopher’s perspective. He emanates awe and curiosity, but there is little to carry the audience along. Two moments really stand out as a testament to the physicality of the actors and ability of Jonathan Berry to direct them: One is gravity-defying, lifting us into space, up and away. The other lays a plethora of train in a path toward hope until reality and anxiety rips the rungs apart. But here in Chicago, this play sits on much different ground than its original home. On October 5th, Jason van Dyke was charged with murder and sixteen counts of aggravated battery of the seventeen-year-old Laquan McDonald. In our world, a black boy can be shot for existing in the wrong place at the wrong time. With the casting of Cedric Mays and Terry Bell as a father and son, both black, there is much to be explored in a relationship that is further altered when we learn the mother, Judy (Rebecca Spence), is white. There are complicated racial dynamics at play, especially when the only men of color are the only characters that enact violence. When Christopher becomes overwhelmed by a police officer and retaliates by hitting him, this is incredibly more dangerous than depicted. In the world of the play (London, where cops don’t have guns), the presence of police is comforting, as they are seemingly a force of protection. This does not translate well to Chicago. And, in another moment of extreme tension, Judy threatens to call the police on the father, Ed, which creates another dire situation treated nonchalantly. Later on, her tears are even weaponized against Christopher as she pressures him to comfort her in a way that compromises his own comfort. Some may question if our youth will witness the actions of the play in this light. Ultimately, it is irresponsible for Steppenwolf for Young Adults to cast not only a neurotypical Christopher, but also perpetuate harmful stereotypes in the name of “diversity and inclusion”. We are past the tropes and tokens. Young people are the ones leading the revolution for change. Young people deserve better than this. Steppenwolf for Young Adults’ The Curious Incident of the Dog in the Night-Time is a paradox of too much and too little on stage. The play by Simon Stephens, based on Mark Haddon’s book, centers around a neuroatypical teenage boy named Christopher (Terry Bell). The show starts with a solvable mystery, but it leads Christopher to uncover hard truths about his own life. This show is a dream for technicians and artisans like myself, because its script leans heavily into its immersive design. For someone like me it was hard to not separate this show from the legacy of its Broadway predecessor. Steppenwolf is one of the few theatres in Chicago that has the budget to pull the show off. Sadly, this production features inconsistent tech and confusing ensemble work. Something that helps and hinders the show is the projections designed by Joseph Burke. While they provide beauty, they lack deeper meaning. The projections are often vapid and disconnect the audience rather than engage them deeper. A moment where the projections do shine is during a beach memory when the projections and actors work symbiotically together. The waves are projected in the distance and stay with the audience the entire scene, giving both a feeling of sinking and utter submersion underlying how Christopher and his mother, Judy (Rebecca Spence), feel. There are other moments of captivating projections but they fade too quickly. Audiences are not given enough time to really sink into what these images mean. One aspect that significantly adds to the show is Rebecca Spence’s performance as Judy. Spence’s brilliant use of language and the way she connect and disconnects with her son offers an engaging take. I found myself wanting to know more and more about the character as Spence gave the audience glimpses into who she used to be and who she has become. However, the minimal set also works against the show’s staging. This is not normally what I expect from Steppenwolf. The characters feel very distanced on the proscenium Steppenwolf mainstage, as if the production doesn’t want the audience to get too close to the mind of the central character. Perhaps the show could have pulled the audience deeper into Christopher’s world if put in a more intimate venue. The most notable element of the show is its choice to illuminate the struggles of the teen mind versus adults. Christopher wants to achieve things in life, but adults often dash his dreams without knowing. This show has moments where it understands the parallels of wanting to pursue your own dreams regardless of who you are. As a whole, innovation is lacking in this production. Steppenwolf for Young Adults’ The Curious Incident of the Dog In the Night-Time is stuck in trying to have its own edgy aesthetic and loses the core themes of the script. There are fragments of beauty and originality but it was quickly lost. The show has all the elements to succeed but audiences may leave wanting more. The Curious Incident of the Dog in the Night-Time runs at Steppenwolf Theatre until October 27th.